Last week, Apple reportedly signed a deal with China Mobile to bring the iPhone to the world’s largest carrier with over 740 million customers. A China Mobile spokesperson later told us that it has been in talks with Apple, but there wasn’t any further information that could be disclosed at that time. However, going by a Wall Street Journal report today, it seems that the iPhone has really landed on China Mobile. 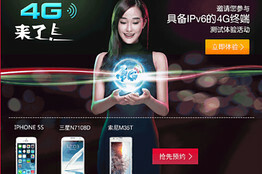 The WSJ spotted an advertisement for 4G that invited customers to place their orders for the iPhone 5s, but when we visited the site, all mention of the iPhone had disappeared — a likely hint that China Mobile may have put the ad up prematurely. However, a China Mobile customer representative reportedly told the WSJ that subscribers can place their pre-orders for the new iPhones starting Thursday through the company’s website and a few branches in Shanghai. Pricing plans haven’t been determined yet, according to the representative. We have reached out to a China Mobile spokesperson for comment and will update with any response provided.